Introducing semi-solids to your baby is an exciting prospect. It’s a delight watching your little one get a taste of something other than milk. But the question mothers often ask themselves is what foods should be introduced to babies? Which ones should be avoided? At six months most babies do not have sprouted teeth, so all food should be mashed or pureed t reduce the danger of choking. It is also advised to follow the three-day-rule-feed. The same food should be given for three days so that you can figure out if your baby has an allergy to it. Always try new foods in the first half of the day. In case you notice any allergy, this gives you time to speak to your doctor and procure medication. Make small fresh portions instead of storing foods. If you are storing, do so in airtight containers and put them either in the freezer or in the coldest part of your fridge. Persevere with the same food. It takes babies at least 5-6 tries before they start developing a liking for certain foods. So, don’t give up if your baby refuses to eat something a couple of times. Switch to some other food and then return back to the food he rejected and try again. 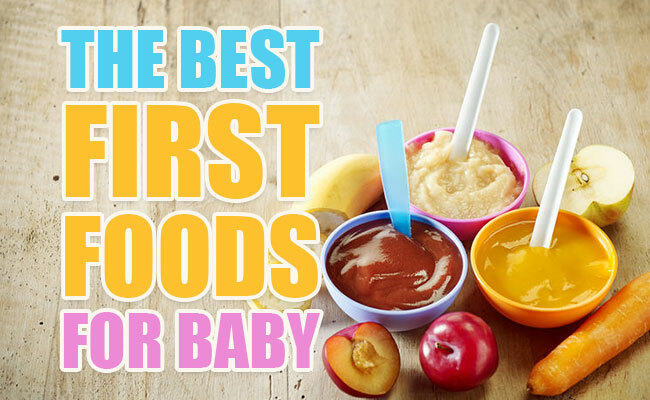 Now let’s take a look at some of the easy foods to get your baby started on. Fruits are a great source of vitamins and super easy to feed your baby. You can start with bananas, apples, grapes and papaya. Bananas and papaya should be mashed and given and grapes – peeled and crushed. Apples can be softened in the pressure cooker and then mashed. If they are in season, then mango and melon are also great fruits to give to your baby. Most babies love fruits since they are naturally sweet. Vegetables are filled with nutrients which your baby requires after he turns six months. You can introduce carrots, potatoes, avocados, peas, bottle gourd and pumpkin, to name a few. The best way to prepare the vegetables is by steaming or cooking them in the pressure cooker and then blending them into a fine puree. You can add salt if you want to, though your baby will be happy enough eating it without salt too. Lentils are an amazing source of protein for your baby. Pressure cook and then mash them with a spoon and strain them. This will remove any big particles which might prove to be a choking hazard. You can add turmeric and salt if you want to. While eggs are another great source of protein, you need to be careful while introducing these to your baby. Many babies are allergic to egg yolk before they turn one so first try giving them egg whites. You can try an egg yolk but stop immediately if you see any signs of discomfort. Also, ensure that the egg is thoroughly cooked with no raw bits. Mealtime should be a fun time, so don’t stress. Instead, make food into an experience your baby enjoys trying out! She is an Education Counselor with over 14 years of experience. She specializes in Career Counseling and Overseas Admissions across the globe. She has completed her Graduation from University of Delhi and Post graduation in English Literature along with a Diploma in Mass Communication. She has worked as Senior Consultant at University of Warwick.